Prime Minister Narendra Modi Tuesday launched various development projects worth over Rs 550 crore in his Lok Sabha constituency and noted that the landscape of the city has changed for good in the last four years while it was at the mercy of the Lord under previous governments. The projects inaugurated include Integrated Power Development Scheme (IPDS) for Puraani Kashi and Atal Incubation Centre at Banaras Hindu University (BHU). Among the projects for which the foundation stones were laid was the Regional Ophthalmology Centre at BHU. Wrapping up his two-day visit to Varanasi, Modi said work done in the city is clearly visible. "Our endeavour is to bring a transformation in Kashi, while keeping intact its traditions and preserving its age-old heritage. Otherwise you have been witness to the system, when our Kashi was at the mercy of Bholey (Bholey ke Bharosey), and it was left to its fate," Modi said. Four years ago people of Kashi had resolved to transform the pilgrim town and today the difference is clearly visible, he said, taking a jibe at previous governments. 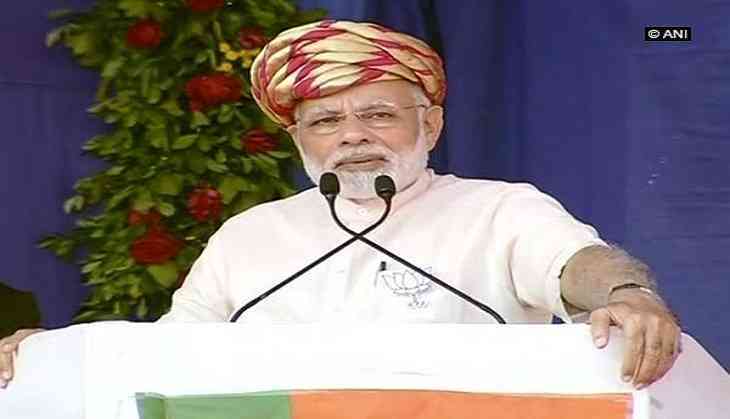 The prime minister said a particular file relating to laying of ring road was gathering dust before 2014 "as the previous government did not allow the project to gather pace as it feared that if the work is done, then Modi will be eulogised". The prime minister said only after Yogi Adityanath took over the state, that work is going on expeditiously. Besides Adityanath, UP BJP chief Mahendra Nath Pandey was present on the occasion. In his 40-minute address, he said projects worth Rs 550 crore have either been dedicated to the public or foundation stones laid today. "This development work not only covers Varanasi but adjoining areas as well," he said. Striking an emotional chord with the audience, Modi began his speech in local dialect and chanted "Har, Har, Mahadev", amid loud applause from the audience at the amphitheatre of BHU. "It is indeed a matter of pride for me that I am starting another year dedicated to the country with the blessings of Baba Vishwanath and Maa Ganga. Your affection and blessings always motivate me and also strengthen my resolve to serve you and the countrymen," he said. The prime minister, who represents Varanasi in the Lok Sabha said, "Before becoming an MP, when I used to visit here, I used to wonder when will this city be freed from the mesh of entangled electricity wires hanging overhead". "Today, a large portion of the city has been rid of such wires and at remaining places work of laying underground cables is going on at a fast pace," he said. On the first day of his visit yesterday, Modi spent his 68th birthday in his Lok Sabha constituency during which he gave a pep talk to school children telling them never to feel afraid to ask questions, saying it is a key aspect of learning. Modi first interacted with students of a primary school at Narur on the outskirts of the temple town and later met students of the Kashi Vidyapeeth.